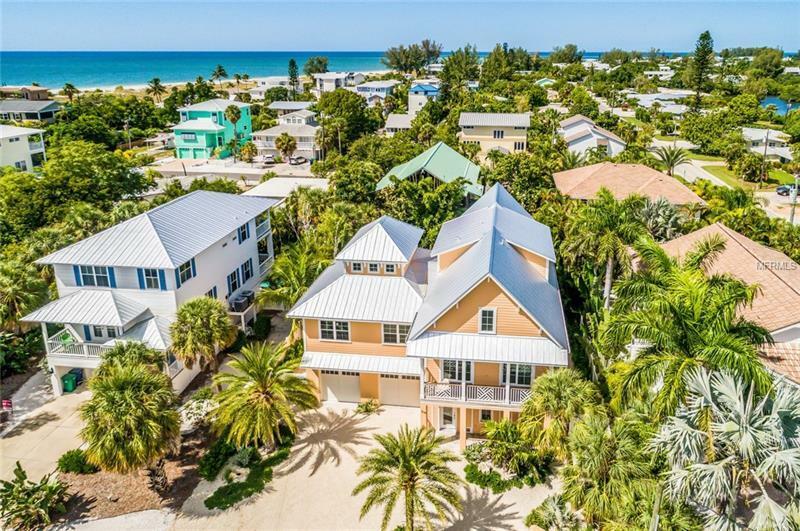 BRAND NEW home just a short walk to the beautiful Gulf beaches of Anna Maria. Conveniently located in the City of Anna Maria one block away from Pine Avenue where there are many boutiques and restaurants. This stunning four bedroom home is 3321 sq ft that offers a spacious open concept kitchen living and dining area for entertainment. There is a large deck overlooking the heated pool spa and tropical landscaped backyard to relax. The gourmet kitchen includes all Jenn-Air stainless steel gas appliances custom cabinetry beautifully backsplash and a large island. The second floor incorporates three large bedrooms with each having their own ensuite bathroom a half bath and the laundry room. The third floor has a large master bedroom with ensuite bathroom and a bonus room for little ones to gather. Other features are wood-look tiles throughout the house elevator to all three floors two attached garages professionally decorated with custom wall paper designs. The home comes furnished and ready to move-in call and book your showing today!